FILE - In this undated photo people stand on the deck of a World War I German submarine type UC-97 in an unknown location. Belgian regional authorities on Tuesday, Sept. 19, 2017 say that an intact German World War I submarine has been found off the coast of Belgium. BRUSSELS — An intact German World War I submarine containing the bodies of 23 people has been found off the coast of Belgium, authorities said Tuesday. The UB II-type dive boat that was found is 27 meters (88 feet) long and 6 meters (almost 20 feet) wide, and is lying at about a 45 degree angle, between 25-30 meters (82-98 feet) below the surface. From the damage to the front of the vessel, it appears that the sub may have struck a mine with its upper deck. Two torpedo tubes have been destroyed but the lower tube is intact and closed. Video images show the submarine encrusted with barnacles and seaweed. It is also adorned with fishing gear, including nets. 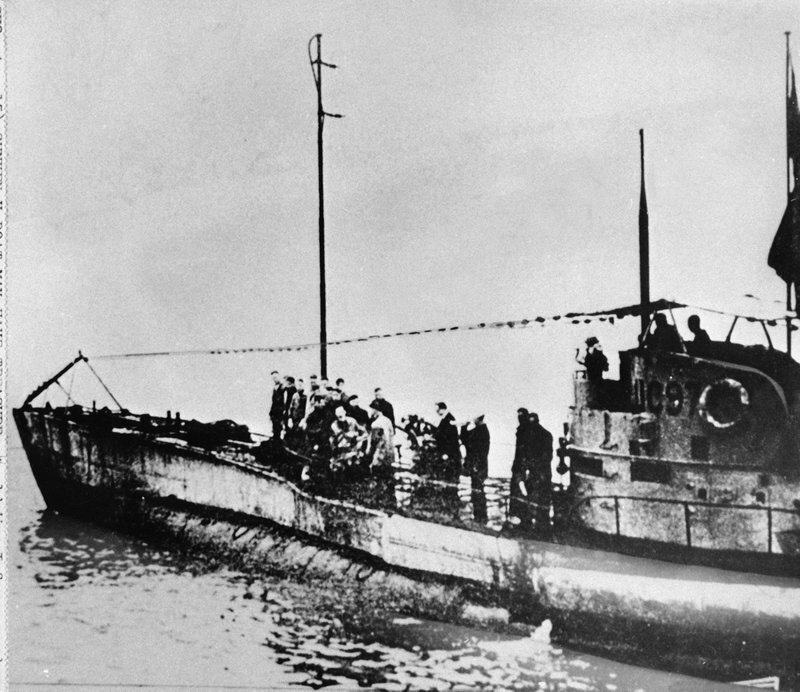 Decaluwe said the U-boat was found by researchers. He declined to provide details about its location until the site has been protected. He has contacted the German ambassador because “we need to see what can do” with the remains. Around 18 U-boats were stationed with the Flanders Flotilla in Bruges between 1915 and 1918. Thirteen of them were destroyed. It’s the 11th such wreck to be found in Belgian waters. Allied warships and cargo ships were easy pickings for the German subs that were launched from Bruges, just across the English Channel.